A microcontoller that is installed in electronic devices are close to home. Among the microcontollers, the STM32 microcontroller is one of the most popular ARM-based microcontrollers used in various products, with many lineups. However, they are not only complicated and difficult to set up, but also difficult to build integrated development environment. The STM32 microcontroller is difficult for beginner. In recent years it has become easy to program with simple code without building integrated development environment with online compiler called mbed. However, since mbed is an online compiler, there is resistance to using work codes in the cloud, regardless of play. Meanwhile, at the end of 2015, ST unveiled the free integrated development environment, System Workbench for STM 32 (SW4STM32) , and the offline integrated development environment can be easily used for free. Although the environment that can use the STM32 microcontoller easily is prepared, books of the ST microcontoller in the world are explained using libraries called STD libraries, and how it is used differs from HAL library promoted by ST in recent years. HAL library is insufficient in information. With this background, I felt the limits of processing speed of PIC microcontoller that I have used for over 5 years, decided to shift from PIC microcontoller to STM 32 microcontoller in 2016. 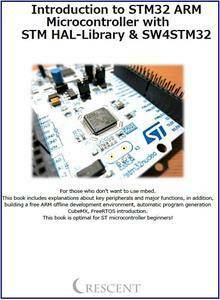 Based on the experience at that time, I compiled this book as an introduction to STM32 microcontoller.